(Hollywood, FL) – In their first official visit to South Florida since winning the recount, Governor elect Ron DeSantis and Lt. Governor elect Jeanette Nunez met with Teach Florida’s leadership in a roundtable discussion and visit to member school Brauser Maimonides Academy in Ft. Lauderdale, FL this morning. 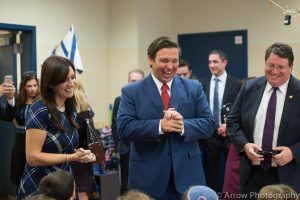 Governor DeSantis used the event to stress his strong support for school choice programs, including tax credit scholarships that benefit 2800 students in Jewish day schools and more than 105,000 students in non-public schools around the state. Teach Florida, the state’s largest Jewish advocacy group and voting bloc for safe, affordable schools, supports the expansion of scholarship and school choice programs. 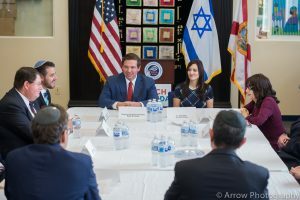 DeSantis also stressed his concern about Jewish school security, “I am 100% behind this funding.” Teach Florida championed first time nonpublic Jewish school security in 2017, in a bill sponsored by Representative Randy Fine who participated in the school visit, and resulted in $2.65 million in security funds in the last two years. Through the efforts of Teach Florida, the orthodox Jewish community registered voters and ran a strong get out the vote campaign for this year’s primary and general election. “There was a 238% increase in our community’s voting in the August 28 primary, and it appears that an unprecedented 70% of our community participated in the general election as a result of our efforts,” said Dr. Allan Jacob, Chairman of Teach Florida. “Our advocacy and votes is making safe and affordable Jewish schools a reality in Florida. “Florida has the weather, low taxes and now we can have the best school system in the country,” said Steven Jacoby, Executive Board member of Teach Florida. 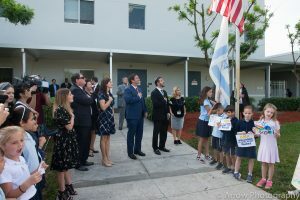 Teach Florida, a member of the Orthodox Union’s Teach Coalition, has delivered more than $88 million in state scholarship and security funding to Florida Jewish day schools since 2011. Teach Florida’s Jewish schools, families, Rabbis and activists advocate for safer, stronger and more affordable non-public schools.